I'm so excited about my new toy. 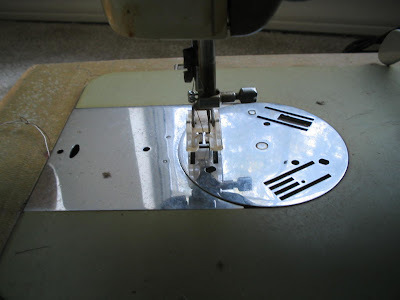 He mentioned to me a while ago that his mother had a old sewing machine that she was getting rid of. I really wanted that machine and he finally got it and gave it to me after yesterday's lunch date. There's no manual, so I googled the maker of the machine to see if I can find one. I need to know what all those levers and buttons are for. You can figure out what some of them do, but there are some levers that simply have numbers next to them and I don't know what the heck they're for. Of course I found places to purchase a manual. It IS the internet. 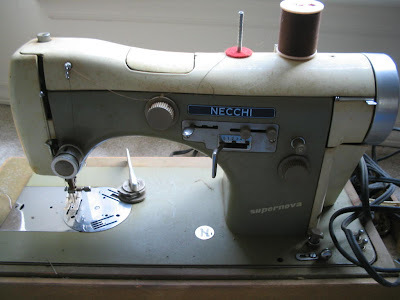 I found out that the Italian company, Necchi, is supposed to be known for making high quality machines. I also read some interesting history about how the company started selling these machines in the U.S. I'm afraid to plug it in because there are some exposed wires around the plug. And since I know that people and electricity don't mix, I'm going to wait until Snookums comes over to take a look at it since he knows about such things. I found a receipt for the machine in the case that shows that it was bought back in 1956. How cool is that!